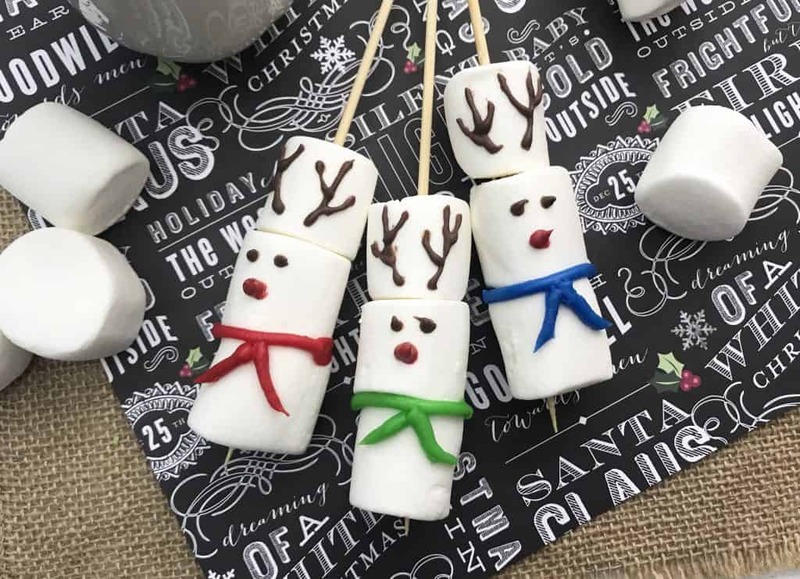 These adorable reindeer stirrers are an easy way to dress up your hot chocolate (this one is my favorite) and get into the holiday spirit! So easy to make that even the kids can help! During the holidays I’m always looking for easy and fun recipes to make with the kids. 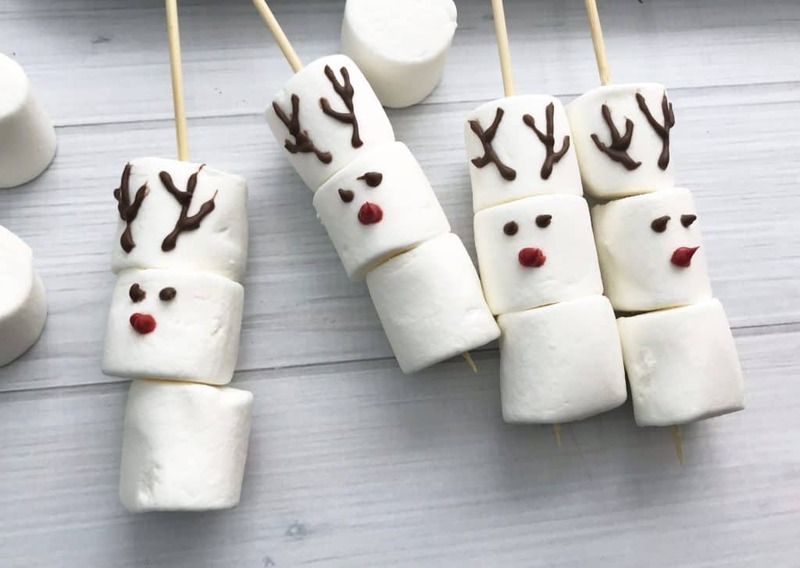 These reindeer stirrers are so easy to make and the kids love decorating them! 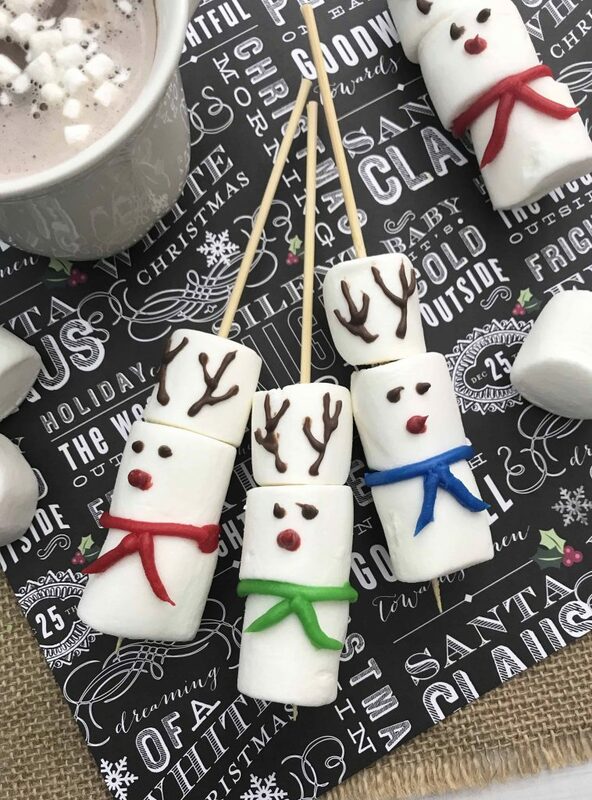 Holiday gift idea: You can also place these reindeer stirrers in a mug, place in a clear bag, tie with a red bow and give as a gift! 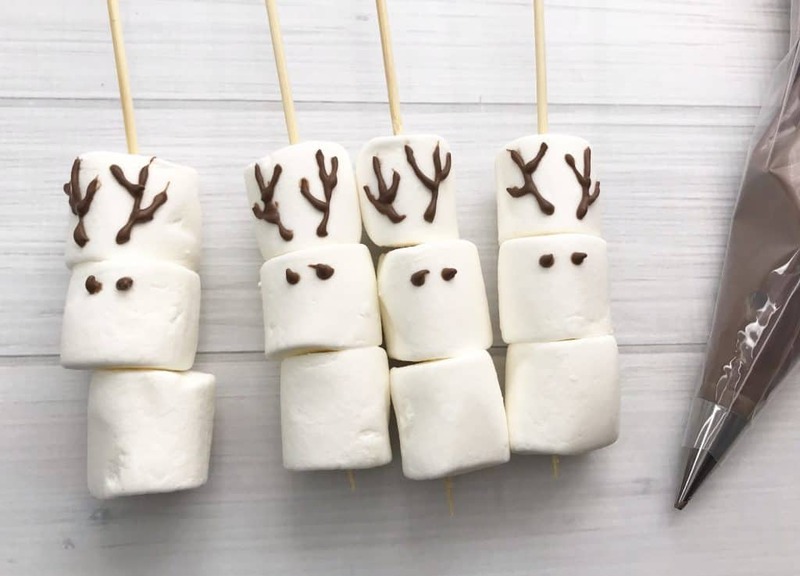 To make these fun and easy reindeer stirrers, you’ll need the ingredients listed below. Trim the BBQ skewers by a few inches using the kitchen scissors. Skewer (3) large marshmallows onto the base of each skewer. Pour 6 oz of the Wilton chocolate candy melts into a microwave safe dish and heat in the microwave in 30 second increments, stirring occasionally until melted. 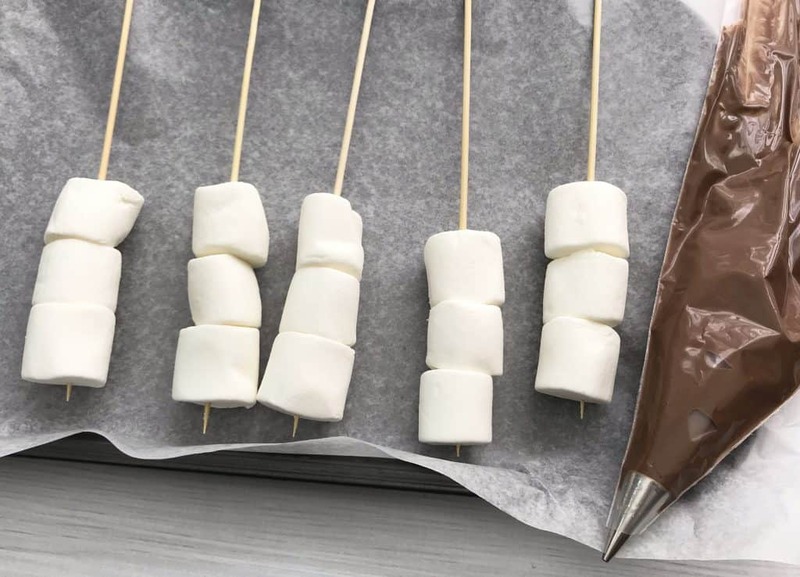 Attach one frosting tip to a disposable piping bag and scoop the melted chocolate into the bag. Gently squeeze the chocolate from the bag giving the reindeer 2 eyes and 2 antlers. Add a small a handful of red candy melts to a microwave safe dish and heat in 30 second increments, stirring until melted. Gently squeeze the red chocolate from the bag to form the reindeer’s nose. Repeat with each reindeer and allow the chocolate to set. 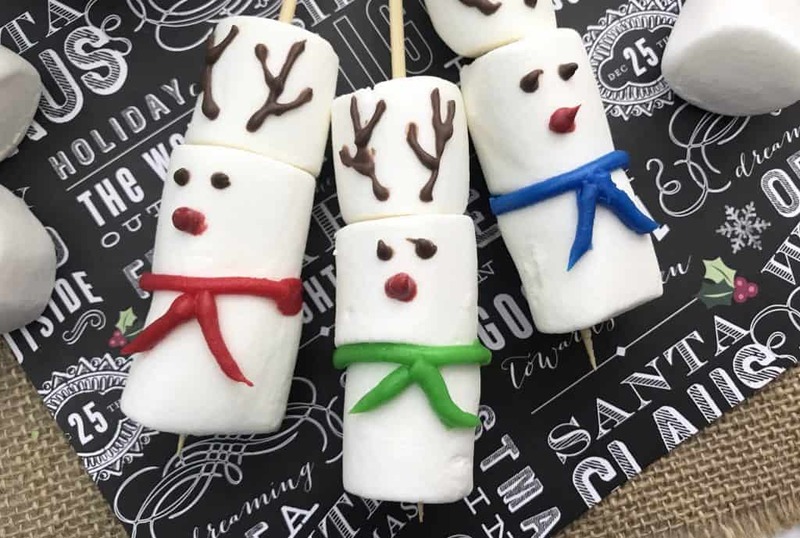 Once the chocolate has set give each reindeer a scarf using the Wilton colored icing (no special tip needed). Serve with hot cocoa or wrap in a cute holiday baggy and give as a gift with hot cocoa! Aren’t they cute!? If you’re looking for more holiday recipes, check out these Gingerbread cookies, easy chocolate spoons, and a fun melted snowman bark!